“Light Bulb” by Nancy Pickard was selected for inclusion in The Best American Mystery Stories 2013, edited by Otto Penzler and Lisa Scottoline! 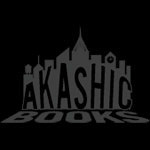 Read “Mission Hills Confidential” by Grace Suh and “Cat in a Box” by Kevin Prufer, featured as part of Akashic’s celebration of Short Story Month 2013. Brand-new stories by: Daniel Woodrell, Matthew Eck, Catherine Browder, Nancy Pickard, John Lutz, J. Malcolm Garcia, Kevin Prufer, Linda Rodriguez, Nadia Pflaum, Phong Nguyen, Andres Rodriguez, and others. “Kansas City is a crossroads. East meets West and North meets South here. Since its settlement in the first half of the nineteenth century, Kansas City has represented a place of opportunity, optimism, and ornery behavior. It outfitted travelers and dreamers on the Santa Fe, California, and Oregon trails. It grew on cattle, grain, and lumber. It nurtured Jesse James, jazz, and gin-slinging scoundrels . . .